Agate is one of the world's most-prized minerals. It is a microcrystalline variety of quartz and is typically formed in volcanic rock. Its natural hardness makes it perfect for jewelry, carvings, bookends, coasters and clocks. 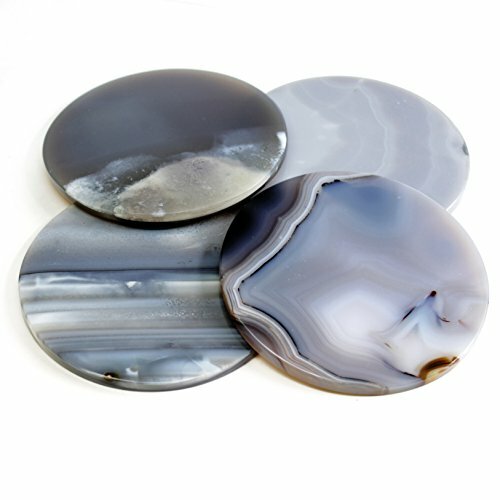 Our magnificent Agate coaster features a high quality and hand-polished Brazilian stone. Coasters can be purchased with silver or gold plated edges to further enhance the beauty of the piece. Due to the characteristics of the natural stone, coasters may vary slightly in color and size (4.5 - 5"). Coasters make great gifts for men and women and are perfect additions to everyone's home décor. Photos represent only a few selected samples - NO Two Slices Alike! Cut & Polished to Create Rounded Edges; Diameter 4"